An engine is basically a glorified pump. If you want to get the most efficiency and power from your engine youre going to have to reduce any form of restriction before and after the engine. To reduce restriction before the engine, you need a good free-flowing and efficient Intake system. To reduce restriction after the motor youll need a good exhaust system to match. This piece was designed as an OEM replacement Mid-Pipe that can be used in conjunction with the OEM Axle-Back section. The M45 has several tight bends and a heavy and restrictive Resonator. 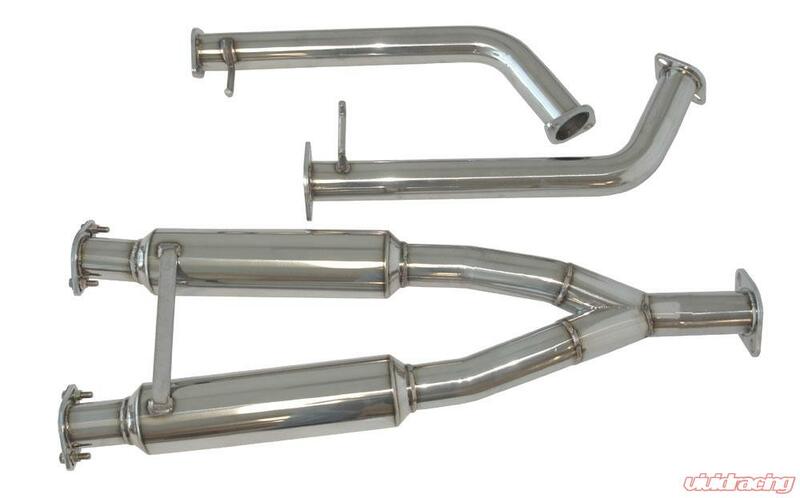 The Megan Racing mid-pipe is constructed of durable T-304 Stainless Steel that is lighter than the OEM piping and has smoother mandrel bends. The Perforated Core resonator is perfect for reducing noise and interior resonance without sacrificing performance while the larger 2.5" piping increases performance through-out the Mid-to-Upper end of the power band.